New listing! 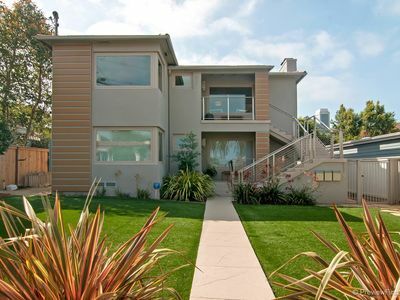 La Jolla home with a rooftop deck, coastal panoramic views! 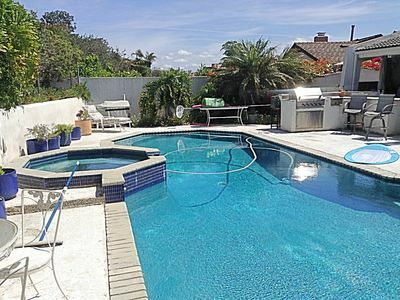 Occupancy limited to a 8 adults or a maximum of 9 guests including children. Equipped with Air Conditioning. Ceiling fans and coastal breezes included as well. Good Neighbor Policy enforced: Noise disturbances, parties or over-occupancy will result in immediate eviction with no refunds. Please contact us in advance of booking to ensure this home is suitable for your group and planned use. Looking for a quiet place to recharge and relax? 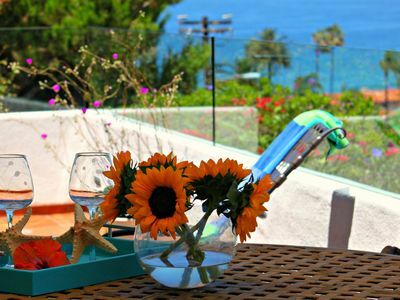 Casa Monte Vista is just the place! Privacy and tranquility come from the fully walled and gated interior courtyard complete with a bubbling fountain and Saltillo tiles. The tropical landscaping creates a soothing and welcoming environment for you and your group to relax and enjoy. 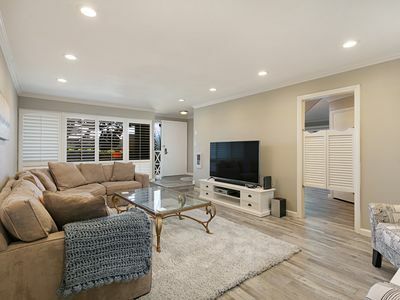 As you enter the home you are welcomed into a beautifully appointed space with touches of classic design elements including wood and tile flooring, 2 fireplaces, wood beamed ceilings, decorative tile accented stair risers. 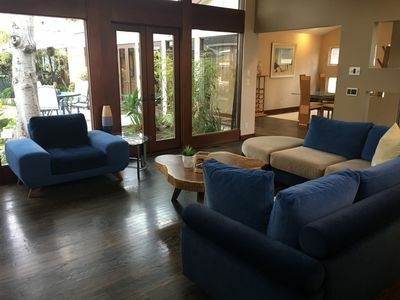 There are 2 living areas, the first being a more formal living room with a grand fireplace and the second family room just off the kitchen with another fireplace and sofa seating. Whipping up your favorite meals is easy in the fully-equipped kitchen featuring granite slab counters and back-splashes. 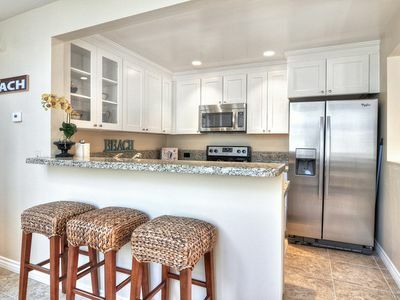 The kitchen also features a prep island, breakfast nook, stainless-steel appliances and a wine refrigerator. 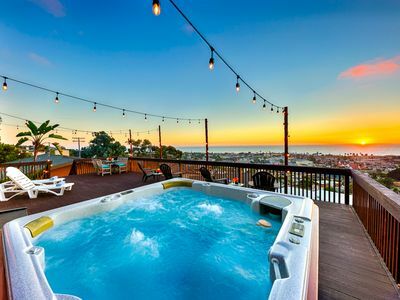 This vacation rental is designed to maximize space and offer guests the coveted indoor-outdoor lifestyle that San Diego and La Jolla is famous for. The residence features several sets of French doors that opening onto tranquil outdoor decks and patios. 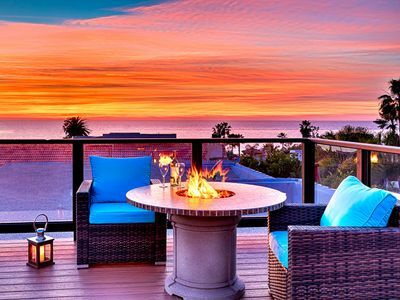 To top it off, there is an expansive, ocean view rooftop deck that provides another space with opportunity for entertaining and relaxing. This is a wonderful place to share with friends and family and dining al fresco under the Pergola will be one of the highlights of your stay. 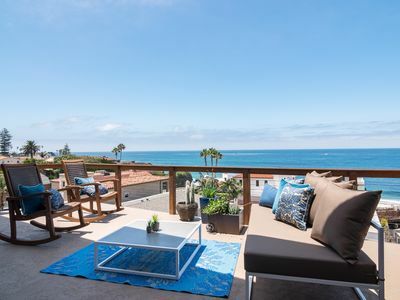 This lovely Spanish retreat is situated in the coveted Beach-Barber neighborhood of La Jolla and is just steps to La Jolla’s famous Windansea Beach, one of the most scenic in San Diego. 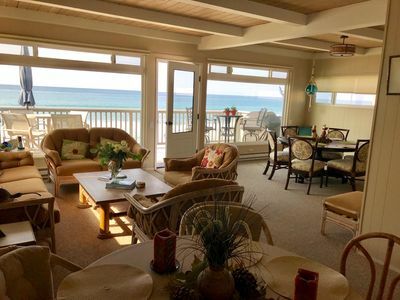 Soak up the sun, watch the surfers and dolphins off shore, or take your morning stroll along the shore take in the salt air and sounds of crashing waves. 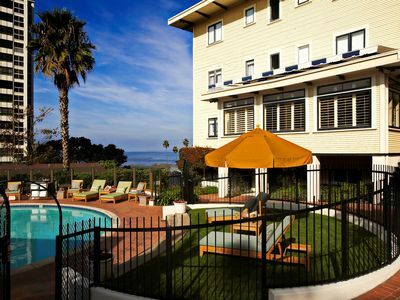 The charming Village of La Jolla is nearby with its world-class shopping, dining and sight-seeing. 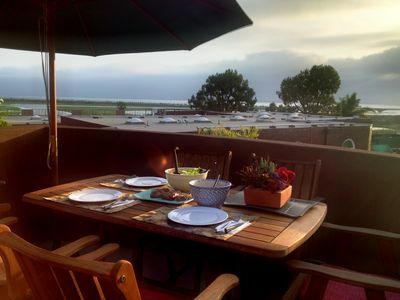 At Bluewater Vacation Homes, our most important job is to help you find the perfect home for you and your group. Our vacation planners are local area experts and here to help you plan your activities to make the most of your stay. Once you arrive, we're available 24/7 to make sure you have an exceptional experience. Please note: A government issued ID and credit card used at booking must be presented at check-in. 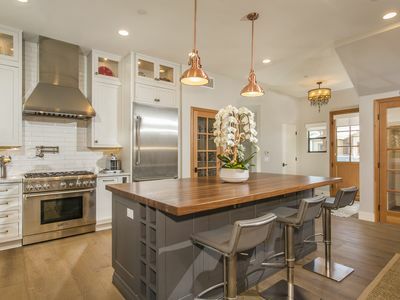 This home is located in a high-density family neighborhood and is only suitable for quieter groups. Deposit forfeitures and evictions are strictly enforced for contract violations. Please make sure you are comfortable with these policies before booking with Bluewater. 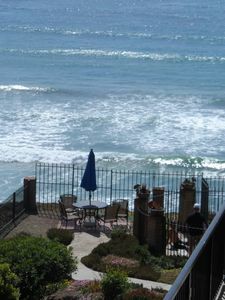 Depth: 19' 3", Width: 8' 7", Height: 6' 8"
Village of La Jolla .5 mi. La Jolla Cove / Children’s Pool: 1.1 mi. 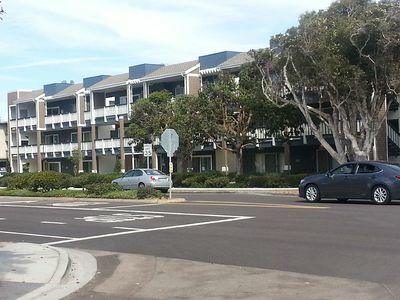 La Jolla Shores: 2.8 mi. Belmont Amusement Park: 4.9 mi. Torrey Pines State Reserve: 9.5 mi. Old Town San Diego State Park: 10.6 mi. Downtown San Diego / Gaslamp: 13.7 mi. Balboa Park and Museums: 14 mi. USS Midway Museum 14.5 mi. San Diego Zoo: 15.6 mi. San Diego Safari Park: 32.5 mi. 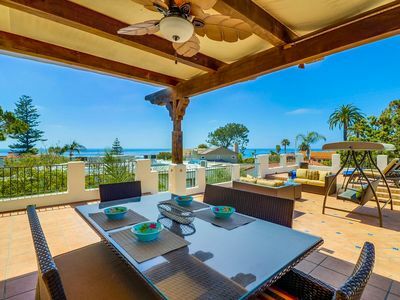 Ocean views, pool, walk to beach, restaurants, and more! 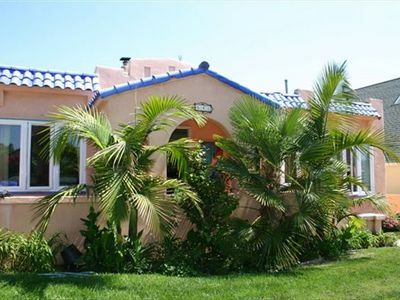 Sailboat Villa: 1 block from the beach, with great ocean breezes! 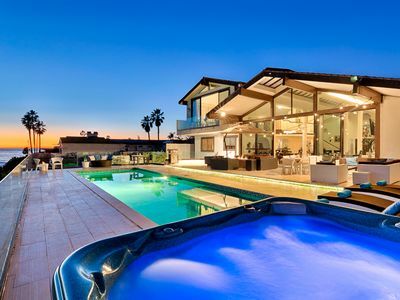 Cardiff-by-the-Sea Home with Ocean Views!! 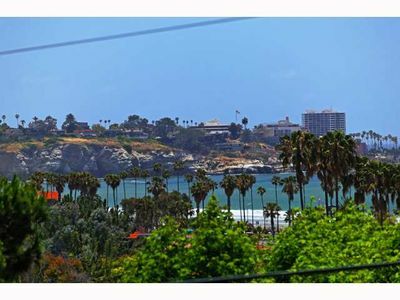 Remodeled, upgraded 2 bedroom, 2.5 bath in the Del Mar Beach Club! 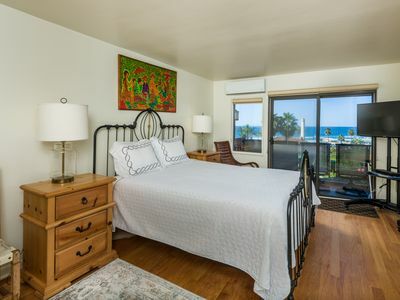 Spacious + Cozy Garden View Studio | Close to beaches!